Each year members of the Florida Farm Bureau’s Young Farmers and Ranchers program compete for the Achievement in Agriculture Award. 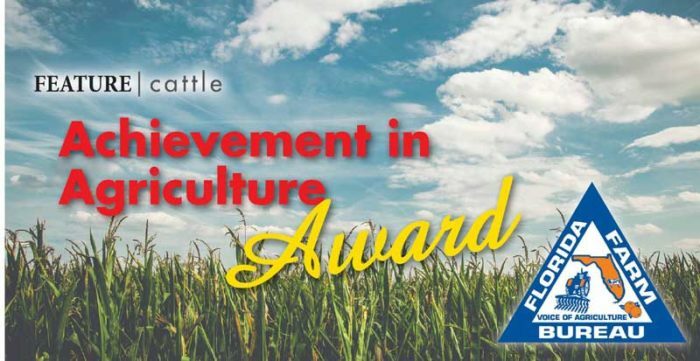 This prestigious award recognizes one member each year who has gone above and beyond in their agriculture involvement on their operation and who exemplifies premier leadership skills both in Farm Bureau and in other outside organizations. They are also weighed in on their operations growth and financial progress over the year. Chance Clay of Putnam County, Ashley and Adam Cook of Gilchrist County, and Andrew Taylor of Walton County are the three finalist that have been selected to compete as this years winner, the competition will take place at this years Florida Farm Bureau Annual Meeting which will be held on October 24 through the 26 in St. Augustine. Both Clay and Taylor are cattle ranchers and active members of Florida’s Cattlemen Association as well. Chance Clay is a sixth generation cattle rancher on Clay Ranch, he was in Class 1 of the Florida Cattlemen’s Leadership Academy, and was the Chairman of Research and Education for the Florida Cattlemen’s Association. Andrew Taylor has been farming and ranching for about 8 years, after being raised in a military farming and experiencing farming from the window of his parents car as they traveled across the southeastern U.S. countryside. “I remember looking out the car window as a kid at different farms and farmland and I just knew I wanted to be a part of it,” Taylor recalled in a separate interview with Walton County Farm Bureau. Both cattle ranchers have been recognized previously before for their implementations of best management practices on their operations and their continuation of them will be evident during their on-site visits by a panel of judges for the final leg of the competition. As each of these gentlemen represent the Florida Cattlemen’s Association as well as their respected areas, we wish them the best of luck. Thank you both for reaching out into your communities to make a difference in agriculture in both the Florida Farm Bureau as well as the Florida Cattlemen’s Association.